It took thirteen years, but element 112 finally has its spot on the periodic table of elements – and a name. The new element has been dubbed “copernicium”, after the famed Polish astronomer Mikołaj Kopernik (better known as Nicolaus Copernicus). The element was originally discovered, or rather created, through experiments led by Professor Sigurd Hofmann at the Centre for Heavy Ion Research in Germany in 1996. 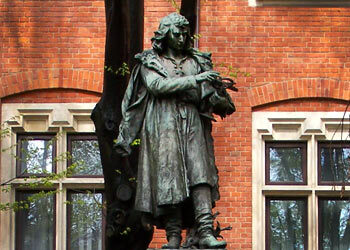 It was Professor Hofmann’s idea to name the element after Copernicus, in order “to honour an outstanding scientist”. The Polish astronomer “changed our world view”, according to Hofmann, by theorising that the planets revolve around the sun, which was indeed a world-changing proposal in the 16th century. Now that the element has been officially added to the periodic table by the International Union of Pure and Applied Chemistry (IUPAC), the union has six months to agree to endorse the proposed name and symbol – Cp.